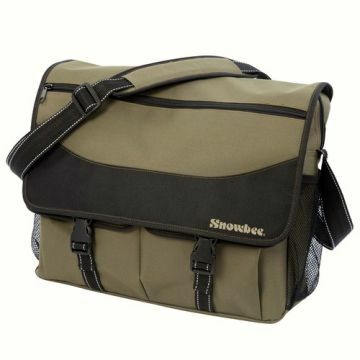 A larger size, traditional Trout/Game bag, with a large interior compartment with a zipped top closure. On the front are two large bellows pockets, with Velcro-flap closures and on each end are two further elasticated mesh pockets for water bottle, flask or accessories. Cover flap with a further full-width zipped pocket and two quick-release clips. Size: 16" x 6" x 13" high.